Hi there! A few weeks ago I bought a few new Olay products – they were on a better than half price offer (£2.95 each instead of £5.99 each), so I had to have them. 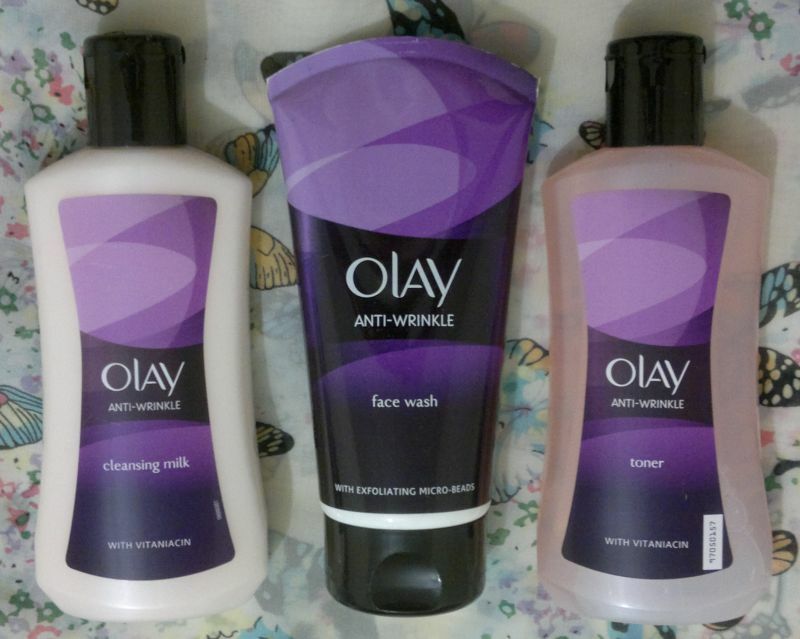 Now meet Olay Anti-Wrinkle Cleansing Milk, Olay Anti-Wrinkle Face Wash and Olay Anti-Wrinkle Toner. – and to “fight signs of ageing as you cleanse” (that’s what it says on the back of these three products). I’ve now used these products for three weeks. And if you read on, I’ll tell you what I think of Olay’s Anti-Wrinkle cleansing products. I think the cleansing milk is quite effective. It removes my make-up very well, and it doesn’t cause any problems when I use it to remove my eye make-up. I think this cleansing milk makes my skin feel and look smooth and supple. Nice! I really like the face wash. It reminds me very much of Olay’s Total Effects Face Wash – the texture and the fragrance are the same! I think this face wash makes my skin feel great. It’s creamy and it exfoliates my skin gently. It’s perfect for dry skin and for everyday use. The toner is very nice too. It removes make-up and cleanser residue without problems, and it makes my skin feel clean and refreshed. Whilst I prefer the fragrance of Olay’s blue toner, I can’t find any issue with this toner. Olay’s Anti-Wrinkle cleansing products are available for £5.99 each. The toner and the cleansing milk are 200ml, the face wash is 150ml. I think you have to use a product for at least six weeks before you actually see any changes. I know it’s hard for me to wait that long to see results. I’m the same way. I’m always looking for instant results. Between Ipsy, Birchbox and Sephora Play, I have a ton of new skin care products to try out. Oh yeah! With all those subscription boxes you’ll never run out of products. I finally moved all of the skin care stuff to my counter top in the bathroom. It’s in a basket that I see everyday, so I’m forcing myself to use it. i love olay skincare ! their cleansers are my favorites ! Olay is my favourite skin care brand. I can’t believe I’ve never picked up these cleansing products before. I never think face washes and cleansers would make much difference for anti-aging effects on the skin. I’d put more stock on serums and moisturizers that stay on the skin for longer period of time! I’m always shocked how inexpensive your drugstore items are! And often on 2 for 3 or half price offers. I too think we’ve got lots of inexpensive, yet awesome products. The last time I was in France I remembered why I never bought any beauty items over there. Everything’s just too expensive. And the last time I was in Amsterdam, the only thing I bought was a shower gel (I only bought it because the hotel shower gel was disgusting…). If you ever come to the UK, let me know! I’ll take you bargain shopping!